Against the Fall of Night tells the story of a boy named Alvin. He lives in a city called Diaspar, which as far as the citizens know contains the entire population of Earth. The book takes place millions (or maybe even billions!) of years in the future, when humans have retreated to this one city after being beaten back in their expansion by the Invaders. Most people are perfectly content in their luxurious city, and terrified of what lies beyond the wall, but Alvin is curious, and manages to find a way out, through a sort of subway system that used to connect many different cities. I found this books to be quite different than most 50s sci fi, in that it hasn't been proven wrong! So many of those novels take place in like the year 2000 or something, and they're amusing now (though still often great sci fi). So it was smart, I think, for Arthur C. Clarke to write a book that takes place so unbelievably far in the future that it's still interesting sci fi today. One thing that irritated me: the language is SO outdated. Not only is the word "mankind" in almost every paragraph, but the human race is actually referred to as "he". It was positively cringeworthy. I know, a product of its time, etc., but it's still annoying. I liked Clarke's take on immortality. The people of Diaspar have chosen to live thousands of years, but the price is that the society is stagnant, and worse yet, there are no children. It paints a pretty bleak picture! This story is a sort of post-apocalyptic dystopia, from way before that genre was popular (as far as I know). 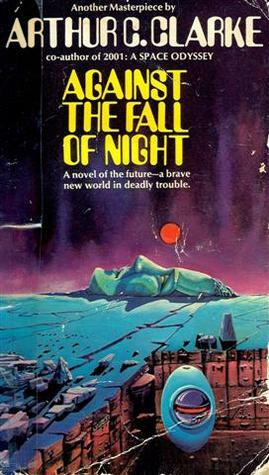 Against the Fall of Night is a quick read, and is well-written, with an interesting story line. It's not going to be added to my favourites shelf or anything, but I've always been more of a fantasy reader than a sci fi reader, anyway. I definitely recommend this one for fans of classic science fiction. Probably my all-time favourite sci-fi novel.